Easy Cuban sandwich sliders made with ham, pork, cheese, mustard, and pickles, on soft dinner rolls. Bake them for dinner or for a party! Thanks for joining me for this week’s #SundaySupper “Supper Bowl” event! Today, I’m sharing a recipe for one of my favorite kinds of sandwiches: the Cuban sandwich. I love Cuban sandwiches. There used to be a fantastic Cuban restaurant not far from where I live, and I used to make excuses to drive through that area just so I could stop in and pick up a Cuban sandwich. When that restaurant closed, I was left with the choice of driving a really long way to the next closest Cuban restaurant, or coming up with something I could make at home to satisfy my Cuban sandwich craving. I’m lucky enough to be able to get Cuban bread at my local grocery store, so finding the necessary ingredients wasn’t a problem. The problem came when I wanted to serve appetizer sized Cuban sandwiches to my family at a big get-together, but the Cuban bread loaves just didn’t divide up as easily as I would have liked. The next time I made this recipe for a party, I decided to get a few bags of soft dinner rolls instead of Cuban bread. Of course, dinner rolls aren’t as authentic as using actual Cuban bread, but they’re certainly a lot easier to cut into individual portions. Not only can you make a large batch of these all at once, but you can also do the preparation ahead of time and then just pop them in the oven when you’re ready. Perfect for any party, whether it’s a simple celebration or a lavish Big Game spread. And thanks to Gallo Family Vineyards, I got to sample a Pinot Noir and a Chardonnay with these Cuban Sandwich Sliders. 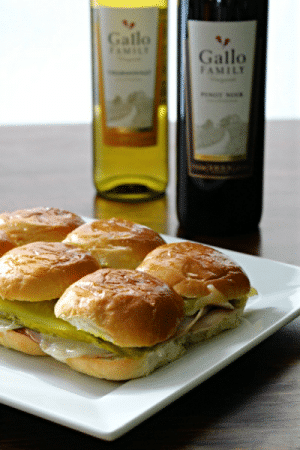 With its notes of berries and cherries, the Pinot Noir made a very nice pairing, and the Chardonnay’s notes of citrus, vanilla, and oak were also a delicious match for these Cuban Sandwich Sliders. If you’d like to try either of these wines, you can use this helpful store locator. I hope you’ll enjoy these little sliders as much as my family did. And if you’re planning to feed a crowd any time soon, be sure to check out all the other #SundaySupper “Supper Bowl” Appetizers in this week’s event! You’ll find the recipe links below this recipe. In addition to appetizers, you might also like to have a dessert that you can prepare ahead of time so you don’t have to worry about it on the big day. In that case, try these Make Ahead Brownies! They’re not only simple, but they also keep well and taste delicious. If you have leftover ham, you can make this kid-friendly charcuterie board. 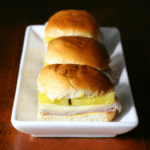 Satisfy your Cuban sandwich craving with these tasty little sliders! Oven baked sliders have never been easier or more delicious. Preheat the oven to 400. Lay out two sheets of foil; each should be larger than one group of 6 rolls. Using a serrated knife, horizontally cut through each group of rolls, creating a top and a bottom. Open up both groups of rolls and spread mustard all over the inside of the top and the inside of the bottom. On each bottom, layer half of the sweet ham, then half of the sliced pork, then slices of swiss cheese, and finally a layer of sliced dill pickles. Replace the top halves of the rolls. Carefully turn each group of sliders over so that the bottom is facing upwards. Gently rub the softened butter all over the bottom of the sliders and down the sides. Once the bottom is buttered, flip each group of sliders directly onto its own piece of foil. Then rub the butter over the tops of the sliders and down the sides. Once the sliders are thoroughly coated, place another piece of foil over the top of each group, then pinch or roll the edges of the top and bottom foil to seal the sliders inside. Place both foil packets on a baking sheet. Bake for 8 minutes, then flip both packets over and bake for 5 more minutes. Remove from oven and let cool for 2 minutes before using your serrated knife to slice into individual sliders. You can prepare the sliders ahead of time! Prepare the sliders (but don't bake them), and place the packets in the refrigerator until you're ready. Then follow the baking, cooling, and slicing instructions. You can learn more about Gallo Family Vineyards on Twitter, Facebook, Instagram, and YouTube. Plus, their website has helpful tips for hosting the Big Game , more great food and wine pairings for game day entertaining, and some football finger food recommendations that might just be perfect for your Big Game party. I love a good Cuban sandwich but sometimes they are just so big. I love this option for smaller ones. Great appetizer! I love these Cuban sliders! They would be perfect for the big game! These would be a big hit with our crew for game day! I had my first Cuban sandwich only 2 years ago—and still haven’t made my own. I love your sliders! All the same wonderful flavors in bite sized form—genius! I had eaten Cuban sandwiches for years before attempting to make them. Now that I have, I wonder why I waited so long- they’re so easy! I love Cubanos and these minis are perfect! Making Cuban sandwiches is on my foodie bucket list. Yours looks amazing and the bread looks so soft. I love it! The bread is super soft! They are my very favorite bakery rolls from Publix. The Cuban is my absolute favorite sammie. This is perfect for game day. Yes, clearly! 🙂 It’s so easy, too! Ohhh I love this appetizer sized sammie!! YUM! Sliders are always a great choice for party food! The way you “press” these is genius. A good Cuban can be hard to find – but making your own isn’t! My husband loves Cubans and I can’t wait to make him these sliders! Love taking a tasty sammie and making it bite sized – so fun! I LOVE a good Cuban sandwich. And even if the dinner rolls aren’t necessarily authentic, they are adorable and perfect for sharing. As long as there is plenty of yellow mustard, I’m all in! Little appetizer sandwiches are a great addition to practically every occasion, so I will definitely be keeping these in mind. We make our own pickles, and they would be perfect for these! Wow, homemade pickles! I’d love to try that sometime. Most of the ones in the store have food dye in them- I was really surprised by that. Those look so good! I love the ingredients, the flavor, and how easy they are to make. Thanks for sharing these. I have never had a cuban sandwich slider but they look and sound tasty. I like how they can be prepared ahead of time and kept in the fridge. I had never heard of a Cuban sandwich before!! It sounds delicious! It is the perfect snack for SUPER BOWL SUNDAY!! My husband would love it! I was just thinking about making mini sammies for the superbowl party we are headed to. I guess I ran across this post at the perfect time! I now know what I’ll be making! 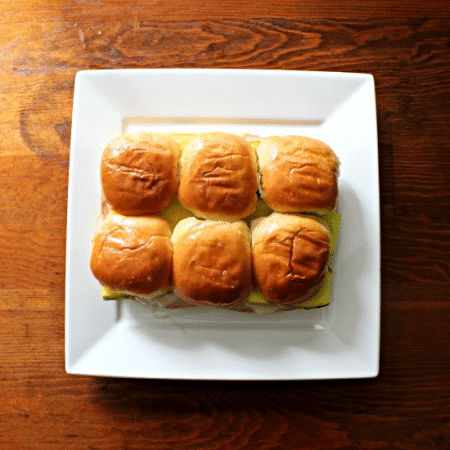 These Cuban Sliders look so delicious and easy to make. I will have to give this recipe a try this weekend. My family is going to love these. I will have to get the ingredients I need to make some this weekend. I am sure it will be a big hit. I love a good slider and these look so yummy!! I will have to try these the next time I have a party! I love making sliders using dinner rolls. I haven’t tried making a Cuban sandwich. I’ll give this a try one of these days. These look great. Sliders are the best! Perfect for parties too. I’ll have to give this one a try next. These sliders sound perfect for Super Bowl sunday. I will have to pick up the ingredients this week so that we can have sliders for dinner. Oh, yum – yum – yum! I am so hungry now! These look absolutely incredible! Oh now this looks delicious! I am going to have to cook it for my kids this Sunday! They would love it. oh my goodness! I think this is my kind of breakfast! I’m going to make this today, it looks so fantastic. This recipe sounds divine! I have always wanted to learn how to make a great Cuban sandwich – and now I know! I’ve never had a Cuban sandwich before, but we love sandwiches over here so I’ve got to make some soon. Thanks for sharing such an easy recipe! Those look so delicious. I’ve never made sliders before but I’m on the hunt for recipes so I can make some.